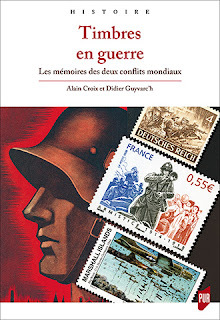 Late 2016 two French historians of Rennes, Alain Croix and Didier Guyvarc'h, published a study on the depiction of both world wars on stamps since 1914: Timbres en guerre. Les mémoires des deux conflits mondiaux [Stamps at war. The memories of both world conflicts]. 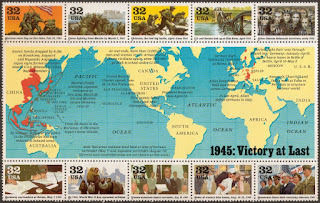 In their introduction and their methodological first chapter, they explained how little historians had used postage stamps to study how governments, postal administrations, and even collectors considering the commercial trend of issues, have commemorated the Great War and World War 2. 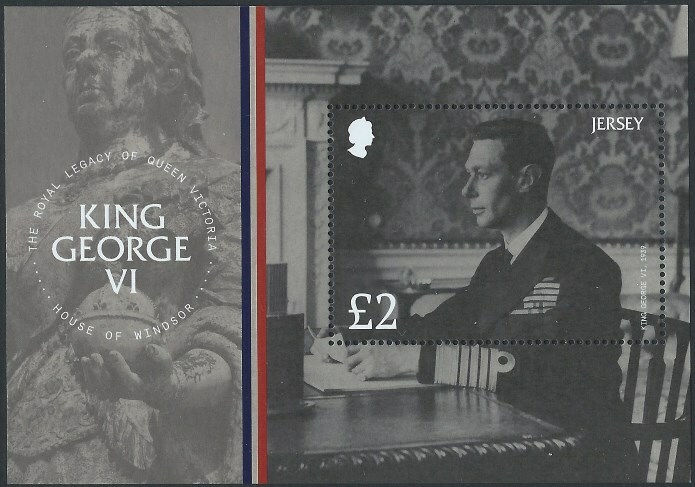 Both author are stamp collectors but it's refreshing to read the current issuance policies in simple words and these policies be considered on how they impact war commemorative stamps: to sell collectibles to collectors and no more to sell a postage proof. The book cover: (Presses universitaires de Rennes, 2016). Chapters 2 to 4 told the chronological stories of the stamps issued. The stamps from 1914 to 1945 are divided in 3 parts: the time of apprenticeship during the Great War ; the stamps illustrating the past war... or the dreaded war (to come?) after 1918 ; and finally how stamps became fully part of the propaganda machines. Chapter 3 expands on what the countries and posts wished their national and international public to remember of the two wars during the Cold War. Chapter 4 starting 1989 describes the evolution between pedagogy (the "memory duty" / devoir de mémoire in French) facing misuse of history and stamps in some countries and on some topics. Chapters 5 and 6 are topical synthesis. Croix and Guyvarc'h summarize the common element and main evolution of their subject, highlighting further some countries and problems of stamp illustrations evoked in the chronological chapters. I try to summarize some of them, that may inspire philatelists in their collection. Mais, et Hiroshima et Nagasaki ? Pas aux États-Unis pour l'émission du cinquantenaire de la Seconde Guerre mondiale. Peut-être aux Marshall... (via CollectorsWeekly.com). All issuing countries are evoked, at least by groups. Post-independence African countries haven't been interested in these topics. Contrary to Marshall Islands, an associated state of the U.S.. The Marshall issue are one of many commercial opportunities to sell to thematical collectors, but Croix and Guywarc'h compare its issues to the United States Postal Service's. Politically what could the USPS put on its stamps when facing the U.S. politicians, veterans' associations and the public's modesty? 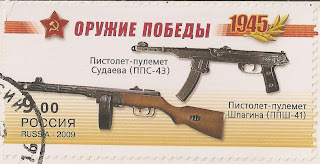 The Weapons of Victory, a long-lived stamp series in Russia. Here the 2009 example. Eastern European issuing policies were diverse and explain how divided was the Communist Block after the death of Stalin in 1953. The German Democratic Republic illustrated as many Nazi German massacres as possible whereas West Germany's first stamp on WW2 was 1955 to rememorate the exodus of Germans from East European countries. Poland insisted on the population's heroism and martyrdom, trying subtely to distance the country from the Soviet Union. The latter have been insisting on the October Revolution (1917) and the Great Patriotic War (1941-1945), putting even weaponry and medals on stamps. The authors consider the genocide of the Jew to be ill-illustrated since 1945. A first criticism is common to many topic: a stamp can be about this tragedy but the reader of the stamp needs to have culture to understand it. Either the stamp depicts a person without any illustration of its life and death, or the subject is treated with highly allegorical symbolism (the 1995 Europa stamps are quoting as examples of this problem). 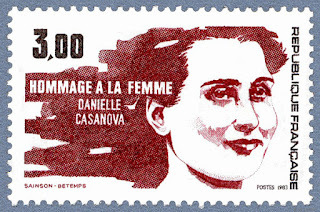 One of the book's example of WW2 or not stamp: Honoring the Woman or very discretly celebrating a French communist resistant who died in a concentration camp? (via Phil-Ouest.com). Exceptions exist of course: explicit stamps of Israel, stricking Austria's Niemals vergessen [Never forget] series of 1946, and the distance many Anglo-Saxon countries put between the wars and their stamps until recently - but for the Australian and New Zealand exceptions since Gallipoli in 1915-1916. The two historians are astounished by the 3rd anniversary of the liberation of the Channel Islands: the gathering of vraic... in the same "back to daily life" way as the British 1946 Victory issue. Seems a tradition when Newfoundland marks its soldiers' sacrifice at the Ypres by "The Trail of the caribou" stamp in 1916. To compare with the graph showing the millions of stamps printed by France for Charles de Gaulle, the last four Marshalls (especially Leclerc), numerous members of the Free French and resistant movements, and the symbolic commemoration of war and deportation. Radio at war issued in Jersey May 2017: finally a stamp to avoid the repetitive issue of the Appeal of 18 June. 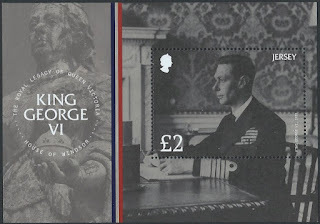 King George VI after the radiobroadcast speech of 3 September 1939 (read on SébPhilatélie). In conclusion, firstly: this book is fascinating for people used to study traces of the past as documents. Who decided the issue? Why this issue? What artist? What image? How many printed? What postage rate: a common one for every one to remember or a seldom use one...? 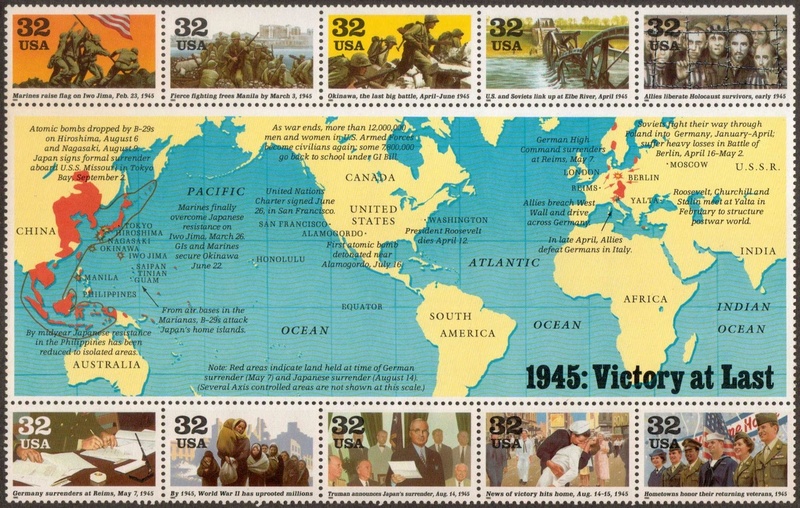 Secondly: the author succeeded partly in their global history of World War stamps. Global history is a way to study and compare different points of view of the same events. For example to study 15th century European discoveries from the African, American and Asian peoples' perspectives. Concerning the differences of depth by countries, they admitted the lack of language skills and access to postal archives to perform to every country what they did with the French Heroes of Resistance series. A must-read that list in the bibliography and notes many philatelic books and articles, and other academics stamp studies all over the world. The Battle of Verdun, one hundred years later, by Maël and engraved by Elsa Catelin (via Phil-Ouest.com). Especially to reflect on the on-going issues: yesterday evening, Thursday 30 June 2017, La Poste presented the best 2016 issues of France after a public survey on the web. In the category of "commemorative single stamp", the centenary of the Battle of Verdun was chosen. Alain Croix and Didier Guyvarc'h, Timbres en guerre. Les mémoires des deux conflits mondiaux, ed. Presses universitaires de Rennes, 2016, 214 pages ; ISBN 978-2-7535-5135-0 ; 29 euros. PUR webpage. Final little criticism: an index by country would have been a very practical idea. Readers, prepare your bookmarks.